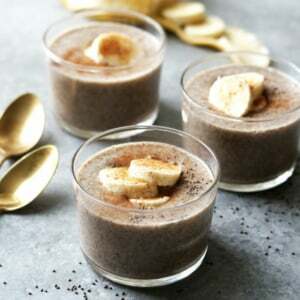 A quick and easy dairy-free pudding that tastes like a coffeehouse chai latte! Feel free to make a large batch and pour it into individual containers to store it the fridge for up to 5 days. It makes a great breakfast or snack on the go! If you don't have a high-speed blender, soak the chia seeds and dates for 15 minutes ahead of time to help them soften and break down easier. Alternatively, you can skip the blending process and use 2 tablespoons of pure maple syrup instead of the dates and reduce the water or almond milk by 2 tablespoons to compensate for the extra liquid. I do recommend using a non-dairy milk instead of water if you don't blend this pudding, to help add creaminess.